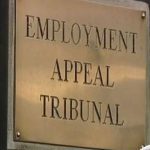 an “In My View” article by NIGEL WARD: Is SBC attempting to protect corrupt staff from criminal prosecution? 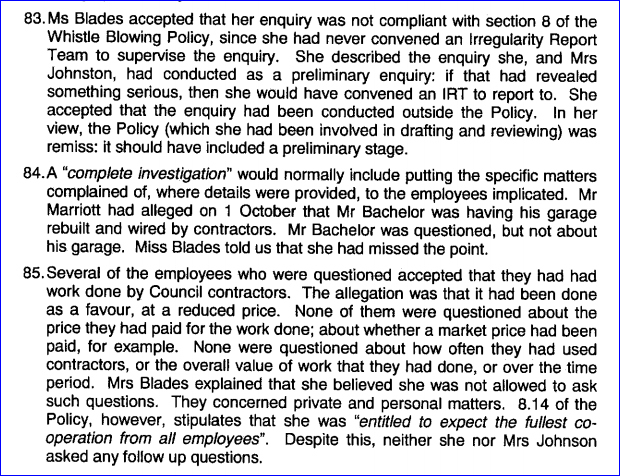 Now that the Ben MARRIOTT corruption allegations are out in the open, a steady stream of information has been reaching me about exactly who benefited from unauthorised use of Council manpower, materials and equipment. 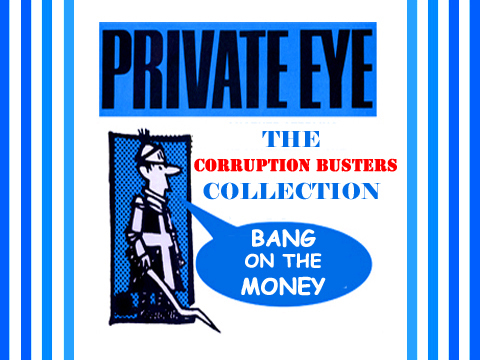 Not all of the sources have been able to provide hard evidence; nevertheless, it is clear from the frequent occurrence of certain names – including names of Councillors (past and present) and members of staff (past and present) – that there has been a long-running and systemic abuse of position by a group of paid and/or elected public servants running well into double figures. Thus, we are not talking about the odd ‘bad apple’ – oh, no. We are talking about organised CORRUPTION – crime in the workplace pursued as a way of life over many years – and a number of promotions. 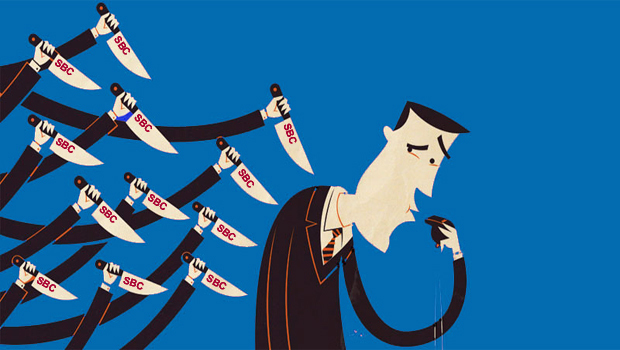 But it would appear that, with the sole exception of Ben MARRIOTT, not a single individual at SBC – Councillor or Officer – had the integrity, the courage or the common decency to “blow the whistle”. Well, the whistle is blowing now, alright, loud and shrill. Yet SBC Leader Councillor Derek BASTIMAN [Con.] has made it known that he wishes to keep any investigation – and there MUST be one – strictly ‘in house’. Still trying to keep a lid on a scandal far more toxic even than the Highpoint Rendel fiasco. 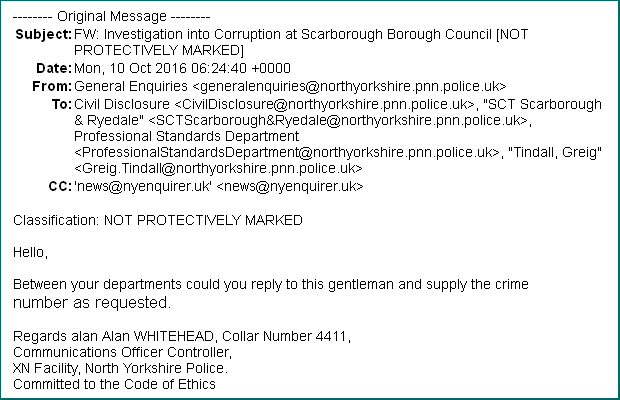 “I wish to advise you there is no information held within North Yorkshire Police to answer your request”. Three years of SBC internal investigation had not produced a single referral to the North Yorkshire Police. 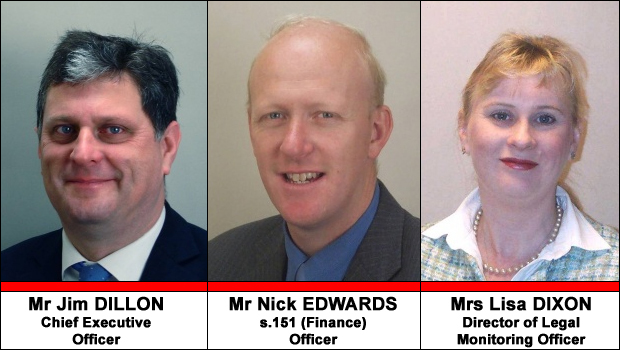 Readers – and Councillors – may wish to contemplate just why SBC refrained from reporting allegations of systemic fraud and corruption to the proper authority – the North Yorkshire Police. 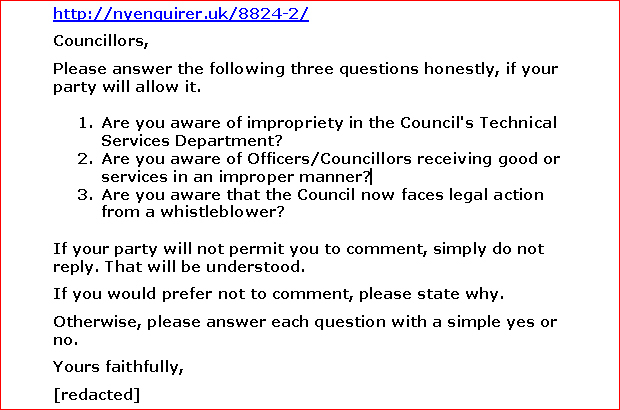 But the big question now is why no-one at SBC responded to an email from a member of the public dated Sunday 7th February 2016, addressed to all fifty SBC Councillors, plus SBC Director of Legal & Democratic Services Lisa DIXON and her counterpart at North Yorkshire County Council (NYCC) Mr Barry KHAN. [The URL-link at the top of the email leads to the second of my four ‘Corruptophenia’ articles, also dated 7th February 2016]. Asking around, I soon learned that not all Councillors received this email. Apparently, Borough Solicitor David KITSON’s infamous ‘filtering system’ kept selected Councillors ‘out of the loop’. So it seems that only Councillors John NOCK [Con. ], Sandra TURNER [Con.] and Martin SMITH [Con.] 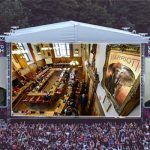 (members of the panel who considered – and rejected – Ben MARRIOT’s appeal) were provided with any information at all about the endemic corruption – and they were lied to by Officers. On whose orders were they ‘misled’? What we do know is that, as far as most of the remaining Councillors were concerned, the answer to all three of these questions was a resounding NO. I say ‘most’ because some, of course, did know exactly what was going on. But what of Lisa DIXON? Why did she not respond to the three questions? 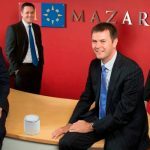 the Council was facing legal action by Ben MARRIOTT. Lisa DIXON knew full well that the answer to all three questions was a resounding YES. Why did she not respond, if for no better reason than to attempt to elicit further information from the sender that, for all she knew, might contribute to the Council’s investigation of Ben MARRIOTT’s corruption allegations? Ah, silly me. 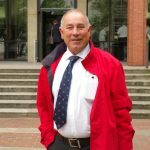 The Council was not in the business of diligently investigating Ben MARRIOTT’s corruption allegations – as Judge Humphrey FORREST made unequivocally clear in his Judgment. 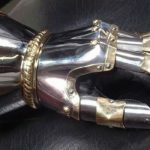 (Readers of an earlier article in this series will be aware that I wrote to Lisa DIXON three years ago, in August 2013, offering to give her the low-down on the corruption in the Technical Services Department. She never accepted my offer). 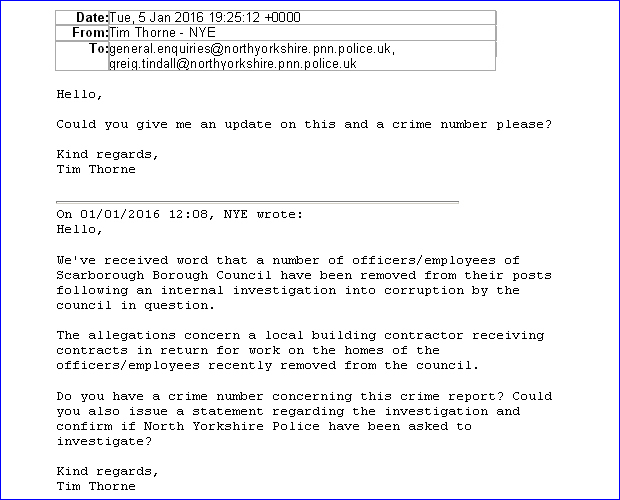 But then, on 7th August 2016, two days after the conclusion of the Ben MARRIOTT -v- SBC hearing, North Yorks Enquirer editor Tim THORNE renewed his efforts to elicit information from the North Yorkshire Police. 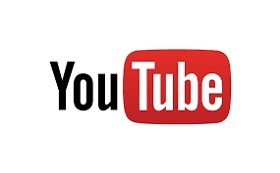 His series of four emails can be reviewed HERE. “Thank you for your email, I have forwarded it to our serious crime unit”. Unsurprisingly, the NYP Serious Crime Unit has yet to approach Tim THORNE, or me – or Ben MARRIOTT. It becomes clear that there was, and is, simply no will to investigate the corruption. How could that possibly be, you may well ask? Could it be that even a half-hearted investigation would have risked revealing that there were beneficiaries of the corruption at the highest levels within the Council? Were the Chief Officers/Directors themselves beneficiaries? 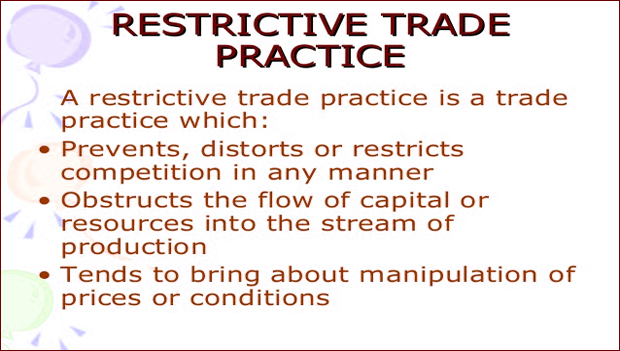 Or leading Councillors? Without a thoroughgoing and impartial external investigation, the public is unlikely ever to find out. But SBC Leader Councillor Derek BASTIMAN is on record confirming a commitment to an internal investigation. Surely he cannot mean Elaine BLADES and Alison JOHNSON – to whom HHJ Humphrey FORREST gave very short shrift indeed at the hearing; either they were utterly incompetent or extremely adept – at keeping the corruption off the record. 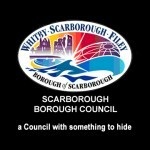 The Scarborough & Whitby Labour Group has issued a Press Release insisting on an external investigation. 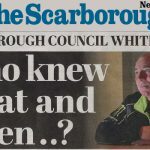 The Scarborough News has published Ben MARRIOTT’s views under the title “Whistleblower calls for council action”. 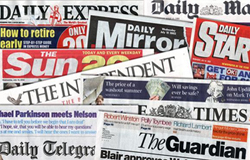 Public reaction, as expressed on social media, is unanimous in its condemnation of the Council’s obsession with secrecy, cover-up and whitewash. I doubt that SBC CEO Jim DILLON and his fellow Paid Service Officers Lisa DIXON and Nick EDWARDS will be able to brazen it out much longer – though perhaps they should publish photos of their own homes and invoices for any home improvements they have carried out in, say, the past five years. In Nick EDWARDS case, he may wish to include any improvements he and his wife Deborah have carried out with their property development company Edwards Estates (Scarborough) Ltd.
And now, on the day of publication of this article, there comes ‘out of the blue’ (as it were) an email from North Yorkshire Police which seems to suggest that a criminal investigation may be underway after all . 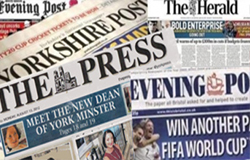 . .
Had SBC (and the North Yorkshire Police) not been so hell bent on smearing the Enquirer, perhaps Councillors might have given credence to our exposés three years ago – and spared Ben MARRIOTT his heart attacks (and the taxpayers of the Borough a small fortune). 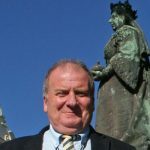 And then there is another huge scandal brewing – just around the corner in the Department closest to Technical Services; Assets, Harbours and Lands – the Portfolio of Councillor Mike COCKERILL [Ind. ]; he of the Sicilian connection.